Words by Kevin Doocey on January 26, 2014 . When Newcastle have trailed games, or even looked for that extra push to try win a game, it is always exciting to have players such as Hatem Ben Arfa on the bench raring to come on. Perhaps sometimes when Loic Rémy on his own up front is not working, Pardew usually opts to bring on Shola Ameobi for Vurnon Anita to hassle the opposition’s back four. Papiss Cissé is another man who has been introduced this season with the hope of grabbing a result against teams, but unfortunately some substitutions have worked out better than others. At this stage, I have reviewed 11 players and their performances so far this season. The eleven I chose are the members which have featured predominately this season, playing a large chunk of the games thus far. Now, in this final article in my ‘Midterm Report’ series, I will look at the other players that have aided Newcastle United in their efforts so far this season. Mapou Yanga-Mbiwa (7.5): The Frenchman has been solid in his efforts throughout the campaign so far. Although a back four of Debuchy, Coloccini, Williamson and Santon has been the norm for Newcastle, Mapou has played a pivotal role in filling in. Considering he is so versatile, it is no wonder he has been involved in over 12 games in the 2013⁄14 season and his defensive qualities were shown when he nullified Chelsea’s attacking threat in a pleasing 2-0 victory over Mourinho’s men in November. Mapou has a big future at the club. Massadio Haidara (7.0): Most fans will remember his shriek of pain at the DW Stadium last season when Callum McManaman carelessly attempted a career ending challenge. Thankfully Massadio recovered well and was involved a lot this season. His opportunities may have been limited this campaign so far but 6 appearances off the bench indicate that Alan Pardew rates him highly. Usually he is brought off the bench to aid our attacking threat down the left-hand side late in games, and although he has not done anything standout so far — the future is very bright for the 21 year old. Steven Taylor (6.5): Stevie T was regarded as one of the finest defenders in our ranks down through the years but with the arrival of a number of defenders the local lad has also had his opportunities limited. With just three appearances so far this season including a disastrous opening day against Manchester City in which he was sent off, it is hard to judge Taylor’s performances in all honesty. In his defence, his efforts against both City at home and West Ham last time out were solid if nothing else, and you can always be guaranteed that he will give 110% no matter what the scenario is. Paul Dummett (7.0): Dummet is in a similar boat to Taylor in that he has played less than five games, however; the Welsh international has been thrown into the deep end when asked to play, with three of his four outings coming against Manchester City (a), Liverpool (h) and Sunderland (a). Alan Pardew obviously trusts the full-back, and at times you can see why; Dummet possesses quite a bit of ability and even grabbed a dream goal against Liverpool in his first senior game at St. James’ Park. He has a big future at the club and hopefully he will play his best years in a Black and White shirt. Hatem Ben Arfa (6.5): Benny is one of the most exciting players at the club. He can turn a game on its head in seconds, and leave some of the best defenders in the country in his dust just as quick. Unfortunately he is all about attack and although Pardew is trying to tone his defensive aspect of the game, it doesn’t seem to be working. However, I am not too worried about that. Ben Arfa single-handedly gave us all three points at home to Fulham at the start of the season and also helped the club to victories against Aston Villa, Crystal Palace and Stoke City. We have yet to see the best of the Frenchman, hopefully 2014 will irk him into some dazzling form ahead of the World Cup. Papiss Cissé (5.5): The story of Demba || is quite a sad one. Having set the Premier League alight with a seemingly supernatural scoring touch upon arrival, the Senegalese international can’t even merit a start at the club now. Lack of confidence and mistimed runs have been the story of his campaign so far. Although he grabbed a fantastic penalty against Stoke City in December, it is hard to see where he will fit in, in the team. Maybe he’ll find his scoring form again and resemble the Papiss we came to know. As the old saying goes: form is temporary, class is permanent. Let’s just hope he can show that class before it’s too late. Shola Ameobi (7.0): When Newcastle recorded a 100% win record for the month of November, Shola was central to the fine form. He looked a changed man, hassling defenders, laying off some fine passes before causing defenders nightmares with his aerial prowess. In a partnership with Loic Rémy, they combined well but the stark truth is Shola hasn’t scored a league goal for NUFC all season. With the World Cup approaching and his contract to expire in June as well, maybe, just maybe he’ll find a resurgence of form and prove to everyone why he has been on the books at the club for 14 years. Well - that brings Tyne Time’s ‘Midterm Report’ series to a close. 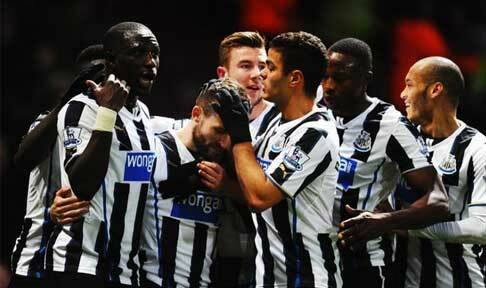 I hope you have enjoyed reading my reviews of each Newcastle United player and their performances so far this season. It is always nice to be able to write positively about most players in the squad and hopefully between now and the end of the season we can push on and try to grab a place in Europe..
Lastly, feel free to give myself @KevinDoocey a follow, and indeed make sure you like Tyne Time’s Facebook page!